Welcome to Cloudy Nights Classifieds! Disclaimer: This section of the website is made available so that our members can buy, sell, or trade their surplus astronomy equipment. Please be aware that Cloudy Nights does not accept or assume any responsibility whatsoever for any transactions between members who use this venue; nor for the enforcement of copyrights or licenses for media, including, but not limited to, software, videos, or written works. It is up to sellers and buyers to perform due diligence with regard to whether the author or licensor deems such works to be transferable to another owner. 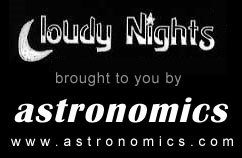 Cloudy Nights will not get involved or intervene in any disputes that arise between any participants involved in transactions that occur through the use of this venue. “Buyer beware” and “seller beware” should always be kept in mind when entering into transactions when using this venue. Have you found or been contacted by a scammer? If you suspect that an ad has been placed by a scammer, or that a possible scammer has contacted you regarding your ad, please use the 'notify administrator' button in the ad to report it to us. It's the quickest way to warn Cloudy Nights administration of a potential problem, so that we can deal with it if necessary. We have noticed a large number of fraudulent sales ads lately in our Classifieds section. The administrative staff have been able to catch most of these before they're even posted. But as hard as we work to try to protect our membership from potential scams, some of these inevitably slip through. The vast majority of these have been high-dollar items, typically posted by someone who has only been a CN member for a few days. The ad pictures and text are commonly copied from prior ads posted on CN or Astromart, or else the ad text is poorly worded and reflects very little understanding of the product being sold. The sellers will often ask that you conduct the sales transaction off the CN site, using their personal email account for any discussion or transfer of information. They will usually claim to be in a location in which it would be impossible for you to inspect the item for sale, or claim to be "out of the country on holiday." They will almost never allow you to use a secure means of financing the sale that offers buyer protection (e.g., PayPal), but will typically insist upon a cashier's check, money order, or Western Union payment. Obviously, none of these factors by themselves really mean anything. There are plenty of new members who have nice gear to sell and aren't set up to take PayPal. But the more of these factors that are present, the more caution you should exercise before entering into a transaction. Please use due diligence before buying or selling anything online, whether on CN or elsewhere. And if a deal seems too good to be true, then it probably is. If you ever have any concerns about a member or a classified ad on CN, please feel free to click the "notify administrator" button, and we'll be happy to check it out. Just try to do so before actually sending money. Once a scammer has your money, there's really very little that the CN staff can do to help you at that point. Yes, we do have the power to ban the scammer, but unfortunately that won't get you your money back. Caveat emptor. Note: Only those who have been members of Cloudy Nights for at least 30 days may post ads in the Classifieds. Members with less than 30 days and 30 posts in the forums may have limits on the number of ads that they can reply to per day. 1. Astronomy equipment and equipment directly related to astronomy are the only items permitted for buy, sell, or trade ads here. When there is a question as to what is “equipment directly related to astronomy,” Cloudy Nights administrators have the final say in making that determination. 2. In the unfortunate event that a transaction should become problematic, Cloudy Nights will not become involved in the remedy. Any issues that arise between participants in a transaction will need to be settled through other channels by the parties involved. Always use common sense and caution when entering into any transaction. 3. Do not cut and paste product descriptions from other websites or sources. We ask that you post a full ad here, written in your own words. Limit the number of words to 400. There is a free word counter online at: https://wordcounter.net/. Item descriptions should be your own. Also, any photos that are included in your ad must be your own. We strongly encourage sellers to use photos of the actual item offered. You may post a link to a manufacturer's website to guide potential respondents to more detailed information about an item you are selling or looking for. Please, do not use the text editor in the ad template to embed photos in your ad. Use the file uploading tool in the template instead. 4. Please do not just post links to sale items that are on other classifieds or eBay. Ads on Cloudy Nights Classifieds must be able to stand on their own as a complete ad. 5. Cloudy Nights is not responsible for ensuring payment methods conform to any agreement, rule, regulation, or law - compliance is your responsibility. Buyers should also understand that by paying for merchandise using PayPal's Personal Payment option (a.k.a. Friends and Family), they forfeit any recourse they might pursue with PayPal should a transaction not go satisfactorily. Ads mentioning using this PayPal option will be rejected, as this is unlawful theft of service and Cloudy Nights can't and won't condone it. 6. Please offer as much disclosure about the item in your ad as would be reasonably expected by anyone you might be transacting with. For example, if the item you are selling is homemade, please state it in your ad. Be upfront when describing the condition of an item. 7. Items for sale must be posted with a set or negotiable price. We do not allow auctions, charitable raffles, "make me an offer" posts, or any other sales transaction types other than those with a set or negotiable price for a specified item. 8. Cloudy Nights Classifieds are not to be used for any kind of fund raising or soliciting endeavors. Classifieds are not to be used as a venue for making announcements. Announcements should be placed in an appropriate forum in the forums section. 9. Members are limited to posting no more than five ads within a 24-hour time period in the Classifieds. Placing a new ad for the same item for the purpose of keeping the ad at the top of the classifieds list ("bumping") is only allowed on a once-per-week basis, and no sooner. If you bump your ad, you must delete the previous ad. Place your ad in the classified section that is most appropriate for the item you are selling. Single ads listing multiple items are allowed. If those multiple items comprise various types of gear, the ad should be placed in the Misc. Items classified category. Please do not place the same ad in more than one category. Select the one category that is most appropriate for the item you are selling or looking for, and place it there. 10. For personal security and privacy reasons, unless you are a registered vendor, please do not post personal information such as phone numbers, e-mail addresses, or mailing addresses in classified ads. It is preferable for persons engaging in transactions to exchange such information in private. However, for the convenience of those reading your ads who may be willing to meet you in person to pick up a large item, you might consider adding your zip code or an area radius within which you are willing to meet someone (such as "within 100 miles of Los Angeles" or "within 50 miles of zip code 12345"). 11. When leaving feedback for another member you’ve transacted with, please choose your words carefully, and please be objective. Feedback is not to be used to "get back at" or to malign another member. We would also prefer that you only leave feedback for other members with whom you have completed transactions. Remember, the person you do business with also gets to leave feedback for you. 12. Members who are found to be scammers and/or spammers, as determined by Cloudy Nights administrators, will lose their Cloudy Nights membership permanently, and without discussion. No second chances! 13. Vendors: Cloudy Nights administration may, at their discretion, assign vendor status to members whose activities in the classifieds indicate that they are in business to buy and sell astronomy equipment for profit. Vendors are allowed to place ads in the classifieds that are from store inventory and/or that may bring them a profit, subject to these Guidelines (unlike the Shop & Swap Forum, where this is not permitted). Cloudy Nights does not enforce vendor copyrights or intellectual property rights, and will not get involved in disputes regarding those issues. 14. There is a "Notify Administrator" button at the bottom of each ad. This is to be used to report problems with the ad to Administration. It is not to be used to ask questions about the seller/buyer or items being sold or sought after. Please use the "Contact Advertiser Directly" button to submit such questions to the person who placed the ad. 15. If your ad is deleted or rejected, you will receive an automatic message that lists several reasons that may apply as to why. Due to the high volume of ads we receive, we cannot at this time personally respond to every deleted ad with the exact reason it was not acceptable. Please carefully review the potential reasons in the message you receive, and try to place your ad again taking into account those possible reasons. We recommend that you keep a copy of your ad text just in case you have to re-do the ad. 16. Third Party Ads: It is our preference that anyone who is able to sign up for a Cloudy Nights account to sell or buy their own astronomy gear do so. However, we understand that there are those situations when a person, for various reasons, cannot undertake such endeavors without the help of others. Any member who might act as a third party representative for a non-member to buy or sell must first contact an administrator for permission to do so, and state why such an ad needs to be placed. All third-party ads must be clearly and prominently marked as such in the first line of the Ad. A member posting a third-party ad must take full responsibility for the transaction. 17. Please, make sure your ad reads the way you want, and all photos you want to use are in the ad before you submit it. If you make changes to your ad after it has already been submitted and approved, it goes back into the approval queue again. It isn't unusual for an ad to be submitted several times because a member thinks that it doesn't have to be approved again. Multiple submissions create extra work for our staff. Please help us to minimize that.